For almost seventy years, Royal Marrakech was the only golf course in town but that all changed in the 1990s with the appearance of first the Robert Trent Jones Snr-designed Palmeraie complex, followed shortly after by Cabell Robinson’s Amelkis golf facility. 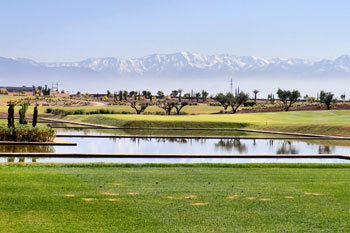 Twenty years on, golf provision in Marrakech has expanded again with the introduction of three more 18-hole courses: Al Maaden (a Kyle Phillips layout which debuted in 2010), Samanah (a Nicklaus Design track that opened in 2011) and Assoufid (laid out by Niall Cameron and unveiled in 2012). There’s also a 9-hole layout at Atlas Golf Club and European Golf Design completed the Montgomerie Marrakech course in 2015, so these are exciting times for golf developers in the Red City. The Al Maaden course is, like all these new golfing projects, the centrepiece of a residential development that surrounds the perimeter of the course. 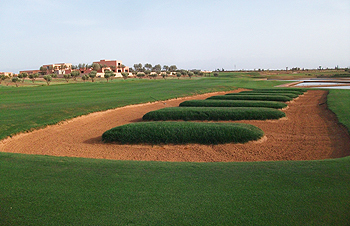 It’s laid out on a rather flat landscape with fairways routed rather uniquely around a couple of geometric water features – one on either nine at holes 5, 6, 12 and 18 – that are intended to give golfers the feeling of playing through a Moroccan garden. A little more earth appears to have been moved on the easternmost part of the property and this section of the course (between the 13th and 17th holes) offers subtle, aesthetically pleasing elevation changes, with several raised greens adding to the interest. And look out at the 18th fairway for Al Maaden’s beautifully manicured half sized version of the famous Oakmont Church Pews bunker. Al Maaden offers only 18 holes but it is a jewel of a course. Everything about it quietly whispers class in an understated and charming way. The range is large and allows practice from the grass itself so you can get a good feel for the turf from which you will be playing on the course: and what a course! Al Maaden offers five different teeing grounds to cater for all abilities and from the whites (second furthest back) it is a beast of some 6,900 yards. However, the generosity of most of the fairways means opening the shoulders needn’t be a problem. In this respect it reminds me of the Ernie Els designed Anahita in Mauritius. Both courses offer the chance to give the tee ball a good pounding although bunkers await a slight pull or push off the ideal line or for a shot not struck with quite the intended purity. However, that is only half the story. There is a definite need to achieve the best angle of attack into treacherous and well-defended greens. In this respect Al Maaden is better protected than most resort courses anywhere. Many of the green sites are built up significantly from the surrounding fairway. This design coupled with spiky, adhesive fairway grass means the run-up shot is made almost irrelevant so precisely flighted irons are the way to go. Missing the greens, which is easily done, means that the short game needs to be on-song too. The upturned saucer green on the par 3 third saw me going from one bunker to another having failed to generate enough spin from heavy sand (next to the casual water) in the bunkers. The four par threes are all equally strong and offer enough variety. The 6th and 12th are almost identikit in their design but are none the less welcome for their similarity. Both have throwback square greens with water short and to one side formed by the square irrigation ponds which have been integrated as aesthetically-pleasing, geometric features to contrast with the fluid shapes of the rest of the course. The 6th in particular at near 200 yards is a beast with bailout options left and long: both of which will leave players with a nerve-jangling pitch to get close to almost any pin placement. The 15th is almost as daunting from the tee; sand appears to be all around what seems like the course’s smallest green. The view from the tee is deceiving as one discovers upon stepping on to the green. There is plenty of green to work with, but stopping the ball with a longish iron is not easy. Three of the par 5s (7th, 13th and 16th) measure more than 540 yards from the whites so are not always within reach into a gentle desert breeze. The 7th green will not welcome a fairway wood easily with its tight opening and sloping green. The 13th is also probably best played as a three-shotter that all but the longest hitters will be trying to play with a wedge for their third into a severely raised green. Some of the best holes are found near the turn with length never the issue but severe green slopes providing the challenge. So Al Maaden tests all facets of the game. Not least of which is putting on the greens that confound even the local caddies who know them best. However, the greatest challenge is kept until the last. It measures 475 yards from the whites with water all the way down the left to snaffle a pulled ball for those seeking a little too much distance. The only salvation down the left is to end up in the copy of the Oakmont church pew bunker. The water then cuts in from the left all the way across the fairway into a pond on the right some 100 yards from the green. A birdie here must feel like a once in a lifetime achievement. In my view Al Maaden is much more than just a resort course, it is the cream of the golf courses I experienced in Marrakech. It offers challenge, variety and beauty in equal high measure. Well worth playing. I’m glad it was the golfing finale of our holiday. However, I would sound one note of caution. With only 20 or so golfers on the property, everyone was paired up (no choice given) and started from the 1st with nobody going off the 10th, just the other side of the 9th green. A marshal then came to our group on the 12th tee to tell us to hurry up: while we were waiting for the threeball ahead of us to putt out on that particular par 3 green. It was disappointing not to see common sense and courtesy being exercised. This can be more of an issue in Marrakech which is equally popular with French and English golfers. The conversation can be stilted where no common language exists among all members of a fourball. I was the only one to speak both French and English in our fourball so my partner felt somewhat excluded from the conversation. Al Maaden was the first of three courses I played on a whistle stop visit to Marrakech last week. It’s now in its second year of operation so it’s still very raw in places, especially in areas wide of the fairways which were still rather rutted. Our group started on the 10th tee, which allowed us to play by far the better of the two nines first. I loved the holes from 13 to 17 where fairways enjoy some rolling movement but the holes immediately before and after this section left me somewhat perplexed. The par three 12th and par four 18th play across the edge of a series of large, square concrete walled structures (which retain water for irrigation) but I’m not sure if this very modern “art meets golf” concept really works. A similar aquatic arrangement at holes 5 and 6 didn’t exactly get my pulse racing either – then again, these “Moroccan garden” features (presumably from the drawing board of landscape gardener Fernando Caruncho) will certainly get people talking about the course, I’m sure! It’s obvious that even though the layout is complete and starting to mature, many of the properties around the edge of the course are still under construction, which doesn’t help the sightlines on such a flat landscape but that external aspect to playing here will obviously improve with time. Al Madden’s a fine addition to the Marrakech golfing portfolio but I’m keen to return to the area again to see how it matches up against the new Samanah and Assoufid courses, situated a little further south.